Rainbow, actors and actresses, baby birth of the whale and aurora, there are many things you may be able to see if you are lucky enough. The submarine in Kobe Harborland is one of them. If you are lucky enough, you may see the submarine of Maritime Self Defense Forces since there is a shipyard of Kawasaki heavy industry. The black object has to be in deep deep underwater where human being cant live but it visible in front of us, it amazed me a lot somehow. It probably very close to the impression when we see the space shuttle came back from the space. If you are more lucky enough, you may be able to see closed “Hanekko bridge”, which is usually opened. 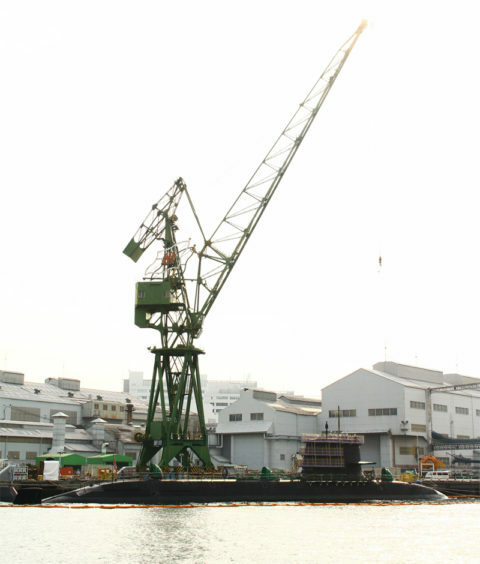 Photo: Submarine in the dockyard in Harborland Kobe.